I’m mostly interested to learn what the actual experience of the competition is like, but in the meantime the Doc has put up two puzzles of the kind you’d see at the championships, although these are his own creation. The first is Japanese Sums, the second is Tetrominoes. Do please check out the original post (and the rest of his great blog – spoiler-free reviews of a wide variety of mysteries and thrillers).These are new formats for me, although the rules are similar to several other Japanese-style puzzles. I think the success of a format depends on how many different tricks and themes they can have. 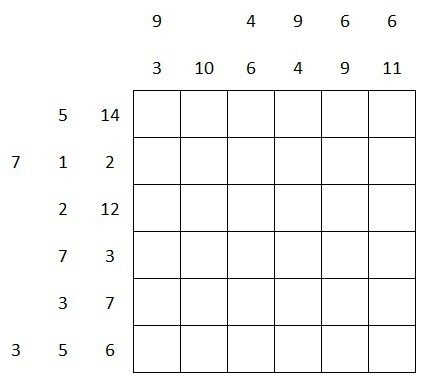 I find Sudoku quite boring in that regard, because there only seem to be a handful of ways to approach them (at least in the vanilla format). On the other hand, the rules for Nurikabe produce dozens of different kinds of sub-puzzles and themes, sometimes within a single puzzle. Unfortunately they tend to be irregularly shaped, which isn’t great for newspapers. Anyway let’s see if we can puzzle these out. 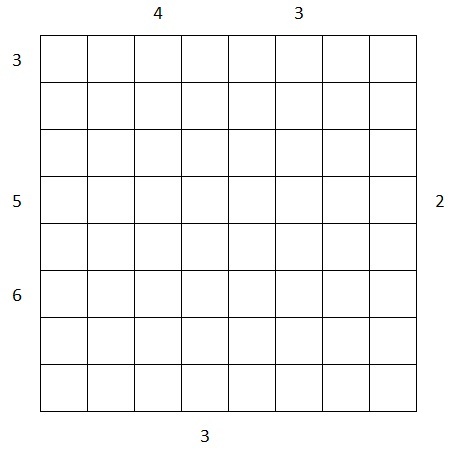 Japanese Sums – in the grid, either shade the cells or place a digit from 1 to 6. The digits cannot repeat in a row or column, but all digits do not need to appear in each row or column. 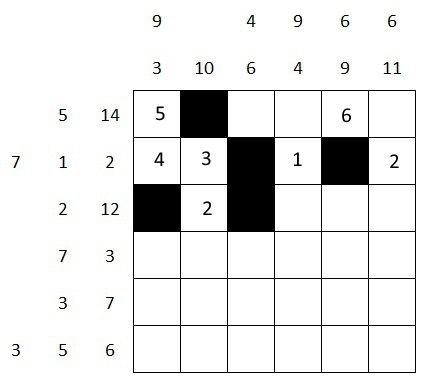 The clues for each row and column represent the sum of each string of digits (or single digit) in that row/column, which must be separated by at least one shaded cell. So where to begin here? The numbers 1 to 6 add up to 21, so that’s our upper limit. 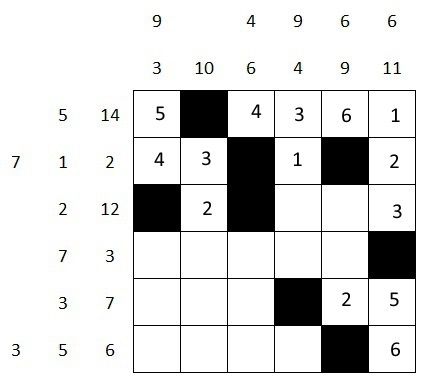 But there are no 21s in the clues, so every row and column must have at least one space. But very big and very small numbers are usually a good place to start. So let’s have a look. 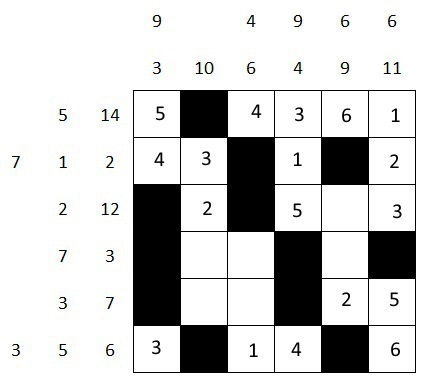 The first row’s clues add up to 19, so that must include every number except the 2. Can we put anything in already? No, because that 5 clue could be a lone 5 or a 1/4 string (in either order). But it does mean the empty space is in either the second or third column. So what next? Adding up the clues gives us 77, but that doesn’t seem very useful. There are some other big clue totals, but nothing as big as the 19. I may be stumped already! Oh I’m being dense. That 1 in the second row can only be a 1. And the same for any 2s – 1/1 isn’t an option because numbers can’t repeat. That’s the sort of thing I mean by rules you pick up as you do these puzzles. With that worked out, there’s no need to go through that chain of reasoning again. Next time I’d immediately begin looking out for the 1s and 2s. So the full clue is 7, 1, 2. 7 could normally be 1/6, 2/5, 3/4 (or the reverse) but the 1 and 2 are needed for the 1 and 2 so it has to be 3/4 4/3. (EDIT: 7 could also be 1/2/4, but that’s obviously not valid either.) 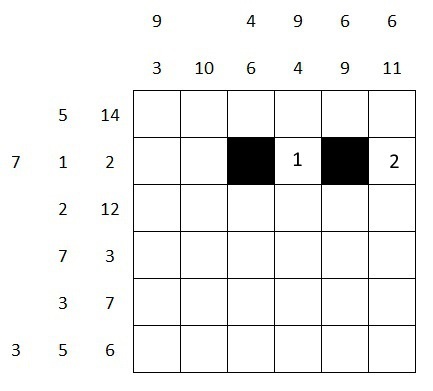 The rules say the strings have to be separated by spaces, so the arrangement for the 1 and 2 has to either be */1/*/2 or */1/*/2/*. But only the first leaves room for the 3 and 4, so that’s what it has to be. And we’re off! What next? That vertical 6, 9 clue has to be a lone 6 and then a 5/4 or 4/5. Nothing else will fit with the space we just entered. But there’s no way to tell if the 6 goes before or after it. Oh wait, I’m wrong about it having to be 5 and 4. If the 6 goes before the space there’s room for 2/3/4 as well. That other lone 2 might be promising. The full clue is 2, 12. How can we make 12 without using a 2? 6, 5, 1. 6, 4… nope. 6, 3… nope. 5, 4, 3. And that’s it. So it’s going to be a three digit string. So the 2 is in one of the first two columns. But we still can’t fill anything else in. I hope this isn’t a super easy one! I seem to be making a meal of it. Oh wait. I’m being thick again. We already deduced the space in row one is in the second or third column. So there CAN’T be a space in column five. So that has to be a 6. Okay. I may be getting into the swing of this. Row two begins with either 3/4 or 4/3 so one of them must be involved in that 10 clue in column 2. It can’t be 6/4 at the top, because there’s already a 6 in row 1. So the 10 string extends at least into row 3. So that’s where that lone 2 has to go. That 9 in column 1 now has to be made by the top two cells. It can’t be 6/3 (again, we’ve already placed the 6 in row one). So it must be 5/4. Which means the 7 in row 2 is 4/3. 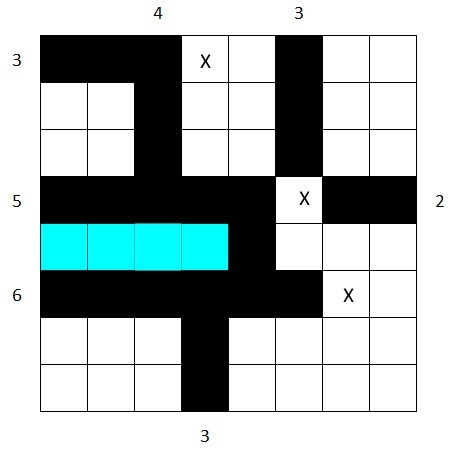 It also finishes the 5 clue in row 1. Progress. So row one, column three has to be a 4. (There’s room at the bottom of the column for 4/*/6, but only room for one space in row one). That means the 14 clue has to be 4/3/6/1 to avoid repeats in column 4. So the 6 in the end column has to be 1/2/3. 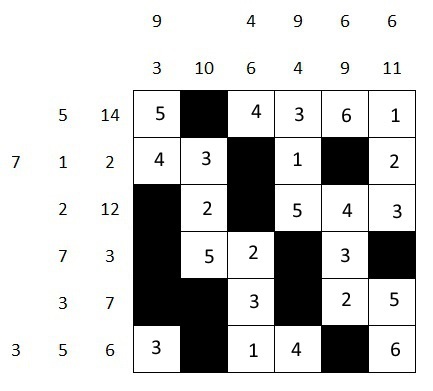 And the 11 has to be 5/6 rather than 6/5 because of the clues in the bottom two rows. So that 7 in the fifth row has to be 2/5. So now we can probably fill in column 4? Yes. The 3/1 we’ve already got means we need a 5, which there’s no way to split without repeating a 3 or 1. So it’s 3/1/5. Then the only space for a 4 is at the bottom. Then that 5 clue in the bottom row has to be 1/4. And then there’s only room for a lone 3 at the very left. That finishes the clues in column 1, so the rest are spaces. Now it looks like it’s just tidying up. 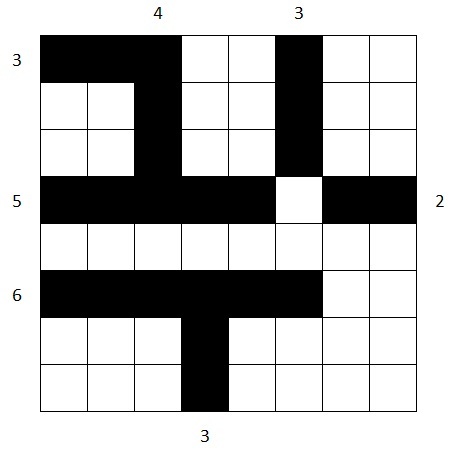 That 10 clue in column two has to be 3/2/5, because if it was a four number string there’d be nothing to satisfy the 3 clue in row 5 (4 is too high, and 1/2 would repeat a 2). Which makes the 7 in row 4 5/2. So the 6 in column 3 is 2/3/1. The 12 in row 3 has to be 5/4/3 which means the 9 in column 5 is 4/3/2. And the last space is empty. With the ease that filled in once things got going, I suspect that probably was an easy one after all. I’d certainly try another one now I’ve got the hang of it a bit, but I wonder if the general pattern is going to be staring at an almost blank grid until you find a way in and then the rest of the puzzle is very simple in comparison. That is one thing I find off-putting about some of these Japanese puzzle formats. I quite like to make constant progress, and for the end to involve as little mopping us as possible. 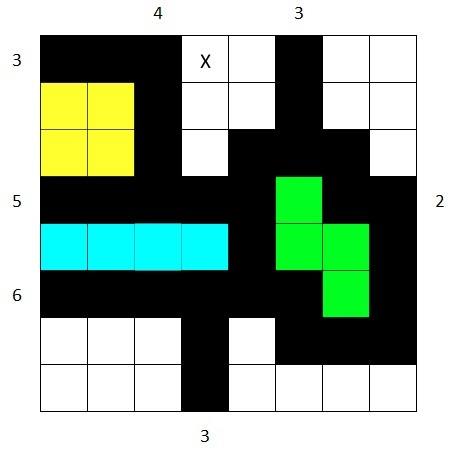 Puzzle Doc’s second puzzle might be an example of this. I can’t really see where to begin. Tetrominoes – place the complete set of tetrominoes (i.e. 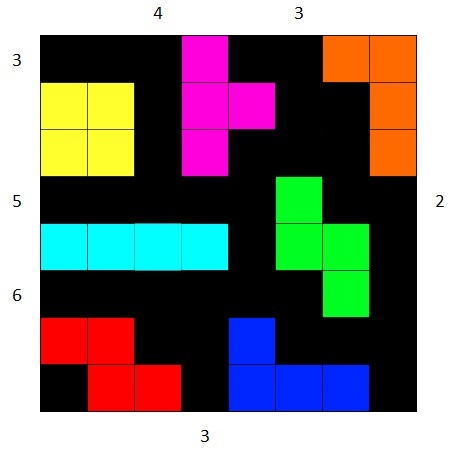 the seven Tetris pieces) in the grid so that the number by a row or column indicates the number of empty cells before the first used tetromino is encountered. An unclued row or column means that there can be any number of empty cells, including none. The tetrominoes cannot touch each other, not even diagonally. So the 7 tetrominoes collectively take up 28 spaces, but I’m not sure that gets us anywhere. With Battleships, another placement puzzle, you often begin by working out where to put the longest ship, but here all the pieces take up four spaces. 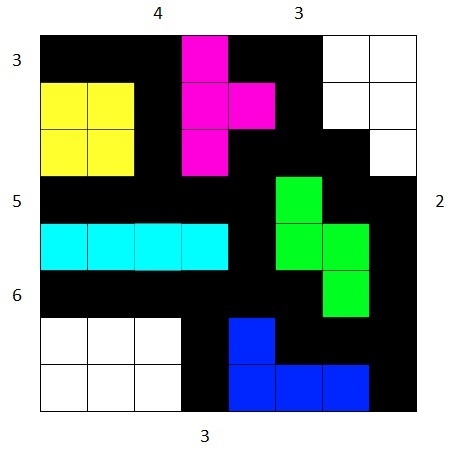 But the 4 x 1 tetromino is the least flexible, so maybe that’s where to start? Hmm. This is going to be very awkward to describe. I seem to remember the tetrominoes are named after letters? Ah yes, here we go: I, O, T, J, L, S & Z. So the 4 x 1 is the I.
Oh wow. This is what happens when I turn my editor’s brain off. I completely misread the instructions. The numbers are for blank spaces, not for number of filled spaces like in Battleships. Okay, so let’s put in those spaces now. And because of the wording, it means the first space AFTER the clued number of spaces must be filled, although we can’t tell with which shape yet. So maybe this won’t be too difficult after all. The grid has already been divided into some pretty discrete regions. Tetrominoes can’t touch diagonally, so we can put in some more spaces. Those two filled spaces in row 5 can’t extend right to meet the space in row 4, because that would make a pentomino (and also diagonally touch the filled space in row 6). So there’s a space to the right of them, and the only way to make a tetromino is if it’s the I. Now the only way for that filled space in row 4 to go is if it meets the one in row 6. That makes it the S. We can also fill in lots more blanks, including the ones diagonally above the S.
Anyway, it’s not too tricky. In the bottom right it can only be the J or the I, but we’ve already placed the I. The zone in the middle at the top can only fit the T, J or Z, but we’ve used the J and the Z wouldn’t include the compulsory space at the very top left. So that’s the T.
Which leaves the Z and the L. But only the L will fit in the top right. Which means the Z goes in the bottom left as I said (and due to the rotational symmetry of the Z/S pieces, there’s only one way to place it). Nice and logical. It only seemed daunting because I completely ignored what the rules said! I wonder how much harder the puzzles in the competition were. Obviously these were pretty simple introductions to the formats, but how much harder could the tetrominoes one get without upping things to pentominoes or higher? Anyway, thanks again to the Doc for the fun. I look forward to hearing about the competition itself. It was pentominos in the real WPC. Still pretty easy though. Glad you enjoyed these. I’m trying to remember which puzzle format I was completely rubbish at. Unsurprisingly, I always liked the “word” ones best, like the wordsearches with the square missing from the centre and the cross-fits with the absolutely bonkers word lists. 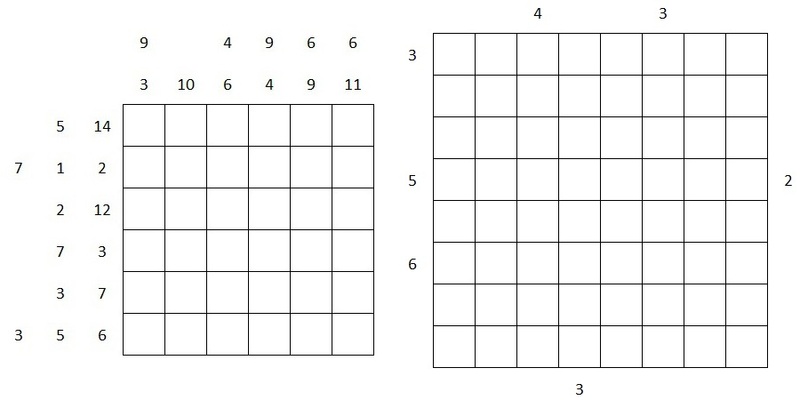 I took a look at the list of Sudoku formats you linked. I got Sudoku’d out pretty quickly, but the Team ones seemed pretty fun. Although I can’t imagine how anyone could manage to adjudicate the rotating format!